This “Badass Content” on Empower Network was about the tragic death of a key Herbalife salesman. If you’re an MLM company facing a PR problem or a crisis involving the firm and its distributors, don’t expect fellow MLM firm Empower Network to solve it for you. In fact, it’s probably prudent to expect that Empower Network will only magnify your bad press or virally blab the things you’re trying to keep in-house. “Tragic” was an apt descriptor, to be sure, especially since the New York Post reported that authorities were looking at the death as a suicide carried out with a gun while the MLM trade tries to come to grips with assertions by Bill Ackman that Herbalife is a pyramid scheme. Peterson was 58, married and the father of three children. He reportedly had earned millions of dollars through Herbalife, in part by driving business to the firm through a purported “leads” program. Herbalife denies it is a pyramid scheme and has sought to distance itself from such “leads” programs. But returning to the subject of all this purported “Badass Content”: The “Team America” post about Nu Skin on Empower Network appears to have been lifted in its entirety from the trade publication Direct Selling News by an Empower Network affiliate interested in getting more sign-ups for Empower Network by using DSN’s Nu Skin story as a lure. Meanwhile, Herbalife’s in-house announcement about the death of Peterson appears also to have been cherry-picked by Empower Network affiliates, reposted on Empower Network’s Blogging platform, repurposed as “Badass Content” and used to lure sign-ups for Empower Network. Yes, really. The death of an Herbalife pitchman in the prime of his life while his family grieves qualifies as “Badass Content” on Empower Network. 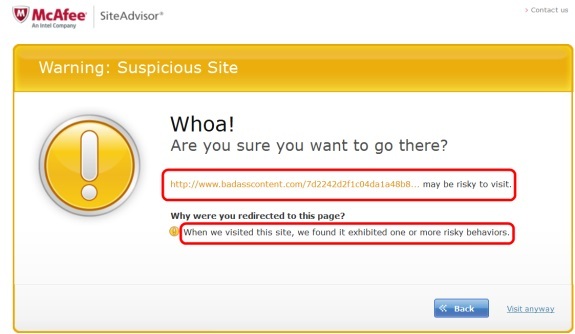 McAfee SiteAdvisor warning about “badasscontent” domain. Red highlights by PP Blog. 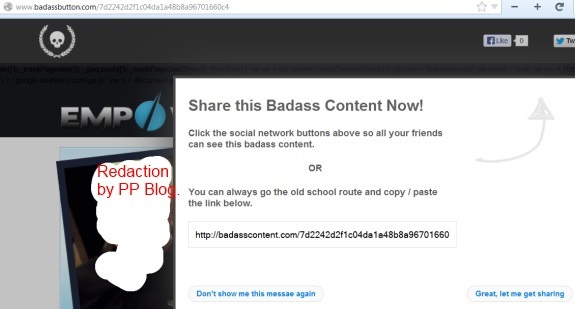 Empower Network also appears to control a domain styled BadassButton.com. Yes, really. Welcome to the MLM La-La Land of Empower Network. It’s like the La-La Lands of Zeek Rewards and AdSurfDaily and MPB Today needed a replacement and that some of MLM’s purported greatest thinkers have decided that what the MLM world really needs is even more madness. Can there be any doubt that MLM is just asking for it? One self-described Christian pastor and Empower Network promoter on YouTube tells his audience that there’s money to be made in Empower Network, despite all the swearing. Just tune it out and recognize that swearing is a personal choice and hardly is limited to the MLM sphere, he instructs. “This is just an open environment where we accept everybody of all types of beliefs, whether you’re a Christian or an Atheist or a Jew or a Muslim — or, you know, you . . . believe in Scientology and all that good stuff,” the pastor explains. Had the pitch for Empower Network appeared on Empower Network instead of YouTube, the pastor could have given his God talk its very own “Badass” button (with a representation of a human skull included) to drive traffic. Did we tell you that the PP Blog received information today that strongly suggested that some “sovereign citizens” were pitching a scheme by which winners in the Zeek Rewards MLM scheme, which the SEC has described a year ago as a $600 million fraud, could short-circuit “clawback” litigation from the court-appointed receiver? We’ll keep you up to date as that MLM La-La Land story develops. There are so many haters on the net against MLM companies like Empower Network and Amway and so forth..If someone besides an Empower Network member would have blogged about John Peterson nothing would have been said..just like you are now , I guess that’s ok if you are down grading a company due to other members doing what you think is wrong. David Wood and Dave Sharpe can’t babysit 160,000 members and control what they blog about..that has nothing to do with Empower Network as a company. Thoughts of MLM being a la-la land…How Much Are You Making Blogging???? Greg Ballew: David Wood and Dave Sharpe can’t babysit 160,000 members and control what they blog about..that has nothing to do with Empower Network as a company. Christian pastors are selling Empower Network, telling the troops that money can be made despite all the swearing. And the Guy Fawkes thing — well, it’s almost too bizarre to contemplate.